The Summer Village at the Pond is gearing up for a new season. These are vacation homes located in Westford, MA. Seventy of the 276 homes have been sold. The units are open during three seasons, only. Prices start in the $180’s. I like the idea of a vacation home nearby, especially one of new construction. No tents or anything like that. There is swimming, hiking, boating, and fishing, all onsite. To me, it seems like a country club, but one that is open 24-hours a day. On June 1, Mom and Dad pack up the kids and head off to the camp. Each weekday morning, “Dad” drives off to work on Route 128, comes home each night, barbecues, takes a swim, spends time with friends and family before bed, then gets up the next morning and does it all over again. Weekends, everyone hangs out at the community room, at the beach, at the adults-only pool. Sounds perfect. Photos and more information, after the jump. 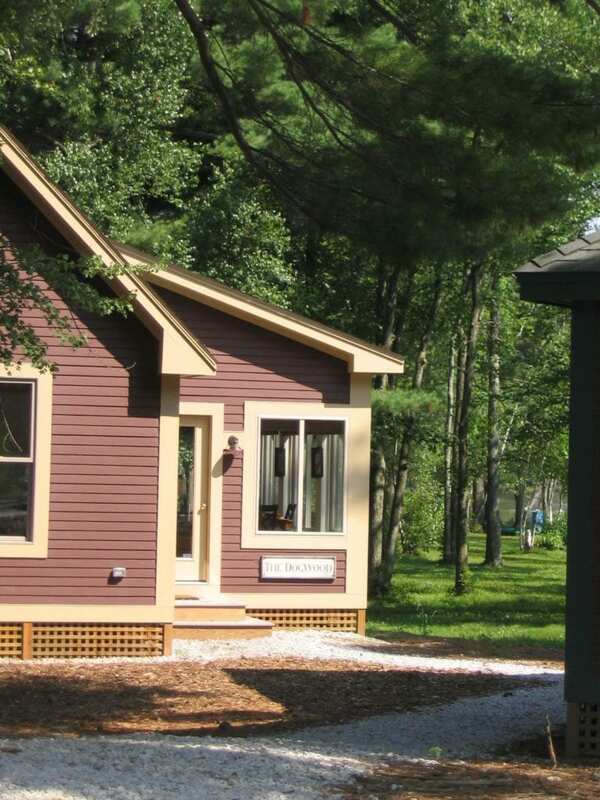 (WESTFORD, MA) – When Wescon, Inc. began developing a seasonal recreational cottage community in Westford, MA, some people questioned the judgment of local developer David Guthrie and his partner and project consultant, Howard Hall. “I think there was some skepticism that people would want to buy a second home in an area that was not known as a vacation destination,” comments Guthrie. One year later, Summer Village at the Pond, Wescon’s seasonal cottage community at Long-Sought-For Pond in Westford, has sold more than 70 cottages, and sales for the community are expected to remain strong for 2008. More than 60% of the cottage buyers live within 20 miles of Summer Village at the Pond, more than a dozen buyers live minutes away in Westford, and many of the remaining buyers have family nearby. “We’re finding that people want to vacation close to home. They love the fact that they don’t have to fight traffic to travel to a second home that is far from family, friends and work commitments,” explains Sales Director Lee Traversa O’Brien. Summer Village at the Pond offers 276 seasonal cottages clustered in small neighborhoods throughout the 159 acre site. The site features 2,600 feet of water frontage, a sandy beach and 105 acres of undeveloped woodlands with hiking trails. As a part of this trail system, each neighborhood has its own “pocket park” – an area for gathering by a campfire and visiting with friends. Long-Sought-For Pond is the recreational focal point at Summer Village. Along the waterfront, there is a sandy beach staffed with lifeguards. The pond is a popular swimming spot, or residents can sign out a community-owned canoe, kayak or sail boat. In addition, the pond is stocked with trout in the spring and fall for wonderful fishing. Recreational facilities include a heated adult pool with a hot tub and a family pool with an adjacent toddler pool; tennis and basketball courts; bocce and horseshoe areas; playground with play structures; and a synthetic golf putting green. Located adjacent to the adult pool overlooking the pond, the Hildreth Gym offers a complete fitness center, showers and changing rooms. The Lodge is located at the waterfront area and includes a pub/grille, pool table and a patio with a fire pit. The building also includes a library alcove, computer area and screened porch. A large, open-air structure called “The Pavilion” is where families gather for a wide range of entertainment, including family game nights, dances and weekly outdoor movies. This is also where many of the daily activities are held, such as children’s activities, crafts classes and more. Located close to the entrance of the community, The Barn houses a general store, carrying groceries, snacks, newspapers and gifts. Residents can grab a morning coffee with a muffin and catch up on the latest news, or make a stop at the ice cream counter for an afternoon pick-me-up. The front porch of the community post office is also a popular gathering place. “It’s like being on vacation for six months even though we go to work every day. Since we are only eight miles away from our winter home, we can enjoy the amenities of Summer Village seven days a week,” comments cottage owner Elizabeth Jones. Professionally decorated models of five different cottage styles are open for tours. The newest style, The Hickory, just opened in February 2008. The Hickory is a two-bedroom plan with an airy open kitchen/living area space and an open porch. Other styles feature two bedrooms and a three-season porch. For a limited time, a select number of cottages are available at pre-season prices from the $180s. The Summer Village at the Pond Sales Center is open Friday-Monday from 10 a.m. – 5 p.m. After April 15, the Sales Center is open daily except for Wednesdays. For more information, contact the Sales Center at 1-800-750-8611 or 978-692-8111, or visit www.SummerVillageWestford.com.